We are no strangers to the awesome custom boot designs of Kickasso. He is back with another super limited edition boot set to “celebrate” the end of the adidas f50 adiZero series. And these boots are pretty glorious. Listed with the tagline “All Good Things Go To Heaven”, these boots are set to be received with applause at the pearly gates. What a boot the f50 adIZero has been and there is no doubt that many of you feel the same pain as we do with its retirement. 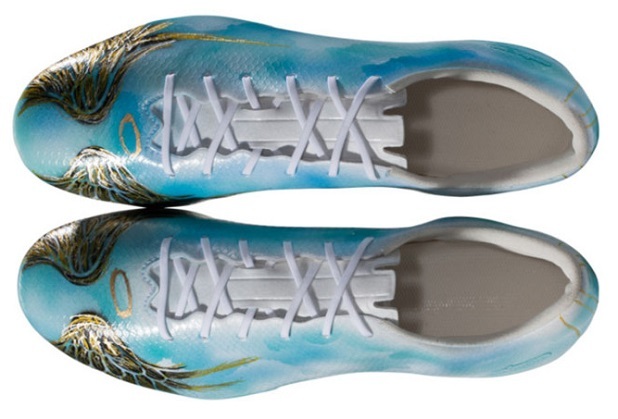 Featuring a sky blue base on what is the No Dye version of the f50, Kickasso adds his personal style via glorious golden angel wings across the forefoot. 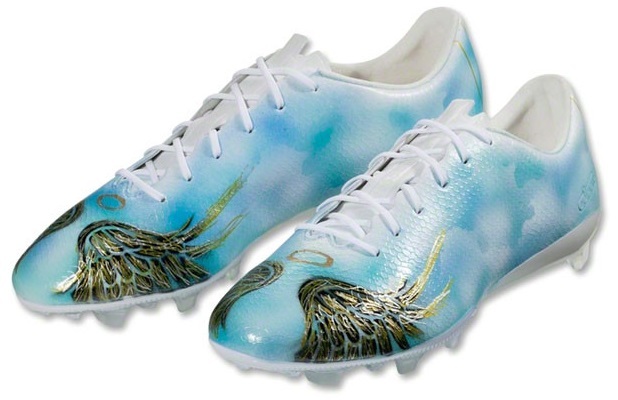 The cleats are signed and numbers on the lateral side, so you know exactly which pair you have. With many stores selling out of all f50 pairs, it also presents the last opportunity to secure a very special pair. Should you be one of the lucky 7, please let us know and hit us up with some images once they arrive! Again, they are released this morning, so keep your eyes peeled to WorldSoccerShop. Was there any difference between the no dye version and the regular f50? Anyone know? Hey, can these be shipped to England if I order them?